Second Avenue near Ellsworth: Angled parking is not in the plan. The board met Thursday night. I wasn’t there, but I heard about the result from City Manager Wes Hare and others. At issue was the extent of proposed “streetscape” improvements downtown in order to encourage business development. The upshot, after what I was told was more than two hours of talk, was that a “basic” treatment would be applied to three blocks of Second Avenue from Washington to Ellsworth streets, two blocks of Third from Ferry to Ellsworth, and one block of Broadalbin from Second to Third. The streets would get a three-inch layer of new pavement, the sidewalks would be reconstructed, and there would be street furniture such as benches and so forth. The board decided against installing so-called “double acorn” decorative lights. Nor would there be sidewalk planters or bulbouts, and there would be no overhead wiring for banners or above-the-street lighting, all of which had been suggested by CARA’s consultants. Also, despite strong advocacy from Novak’s restaurant and others, there will be no angled parking. Consultants had told the city that diagonal spaces would not yield much additional parking but would create congestion that would keep people from going downtown, causing business to suffer. So we trade off $1.4 million of essential services like police, fire, library, county services, vet’s home, 4-H, and education for three inches of unneeded pavement, unneeded sidewalks, and unneeded street furniture? How much tax increment will be generated by this ‘investment”? Zero dollars, of course. Does this make sense to anyone other than the CARA cabal? I can’t wait to sign the petition that prohibits CARA from using tax increment financing. I suspect a yuge (to use a Trumpism) majority of voters feel the same. That much asphalt could be used for much more needed patching to keep other streets from falling into MORE SEVERE disrepair. I did attend Thursday’s CARA board meeting. To be blunt, the board ignored some viable options regarding diagonal parking. While it is true that Corvallis streets are wider, they also employ diagonal parking on both sides of the street. The vote taken was under the belief that any diagonal parking would REQUIRE reducing traffic lanes from two lanes to a single lane, which simply is not true. 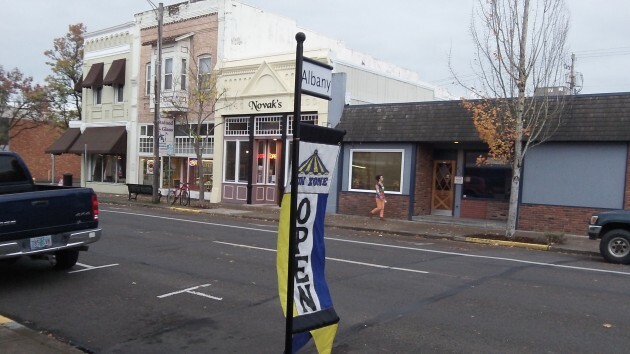 Albany’s 42 ft. street width CAN accommodate diagonal parking, done correctly, on ONE side of the street with parallel parking on the other using standards and lane widths currently in use in Albany and Corvallis. The board, individually, received drawings and documentation proving diagonal parking could be provided on one side of the street, with parallel parking on the other while maintaining two 10 foot traffic lanes by using a 45 degree angled parking layout, with a net gain of 7 parking spaces under the best scenario compared to the current parallel layout on both sides. City staff designs used a 60 degree layout to bolster their “one traffic lane” theory which requires 1-2 feet more width from the curb than the 45 degree layout used in Corvallis. Further, if the city decided a one traffic lane solution was feasible, there would be enough left over width for diagonal parking on BOTH sides of the street, with a net gain of TWELVE spaces. City staff also noted “bumper overhang” of 3 feet would be required for diagonal parking while failing to recognize the same space is required for open car doors when parallel parking. Also cited was “interference” with lamp posts, benches, and waste receptacles, again ignoring the same “interference” exists with parallel parking, and they discounted the fact that those fixtures could be placed to avoid that interference, as suggested by one councilman. Simply put, the board as a whole, never considered some of the information available to them and voted without discussion of ALL of the options before them. The last paragraph of the second link should get the city’s attention. The city’s consultant, George Crandall, had cited “congestion problems” and counseled the board strongly against congestion while noting that “every on street parking space is precious” as some of his preliminary design elements would eliminate several parking spaces that (wisely) the board voted against. Kudos to the board for voting against “parking space eating features”, and others. Overall, I was pleased the board didn’t go for everything in the design proposal but I can’t help but think the diagonal parking issue has not been settled. Time (and the ADA) will tell. If you were there, then you obviously saw the split-votes on all the enhancements to the Streetscape plan[s] — and the passionate arguments on all sides. There was but a single (and rare!) unanimous vote: no diagonal parking in the single block. IF I was there? I was there alright and saw the board decide on parking based on INCOMPLETE information and the false claim that diagonal parking would REQUIRE a single traffic lane, as I explained above. I’m getting tired of repeating myself, Ray. If the city doesn’t want diagonal parking, that’s fine with me…..but don’t give the public the B.S. excuse that it can’t be done with two lanes of traffic…because it CAN BE DONE. Just say you don’t WANT IT. You best read up on that Ninth Circuit Court of Appeals decision in the first two links above, Ray…along with all the other board and council members. It applies to the entire nation.The city does not have the power to ignore the ADA, and you know it….unanimous vote or not. I kinda thought the unanimous vote was quite unambiguous. No? Hypothetically, say diagonal goes in at some point. Which businesses do you want to tick off by not having it on “their” side of the street? OK, better said: Just say you don’t LIKE it. Don’t use inaccurate/incomplete information as “political cover” for your decisions. It’s not very “transparent.” Kinda like voting for the leader of a totalitarian regime with only one candidate on the ballot. Now tell us how you deal with the ADA problem? The city council is far more concerned about “grovelling” for the few downtown business owners than serving the MAJORITY of its citizens. And my two cents added to very fine logic of James Carrick. The angle parking also makes it easier to get in the spot allowing for the traffic to move more smoothly. The math below is getting a little too difficult for me to answer. “Now tell us how you deal with the ADA problem? questions that will no doubt need to be resolved through legislation, regulation or, more likely, further litigation.” I suggest the litigation is long from over — and it will be a long time before it will materially affect small towns like Albany. Apparently the City of Corvallis arrived at a different conclusion long ago. My plan uses the EXACT specifications and measurements in use there on many downtown core streets. Suggest all you want Ray, but the Ninth Circuit Court is only one step below the Supreme Court, the only court the decision can be appealed to. IF they take up the matter. Often they don’t. If they don’t, the Ninth Court decision WILL BE the final word on the matter. What was that about “small towns like Albany”? Nuff said.